They’re here – and one of them is cheaper than the iPad 2. Asus demoed their dinky Android Transformer tablet and their Windows Slate today and the Transformer by itself comes in £20 cheaper than iPad 2.
iPad 2 costs £399, the Transformer (without the keyboard) is going for £379. With the keyboard the Transformer is £425. The Slate – running Windows 7 is basically a desktop replacement and the enormous price – £999 reflects the huge i5 chip inside and large screen. Both are in stores from 6th April and available for pre-order from midnight tonight – Asus.com. 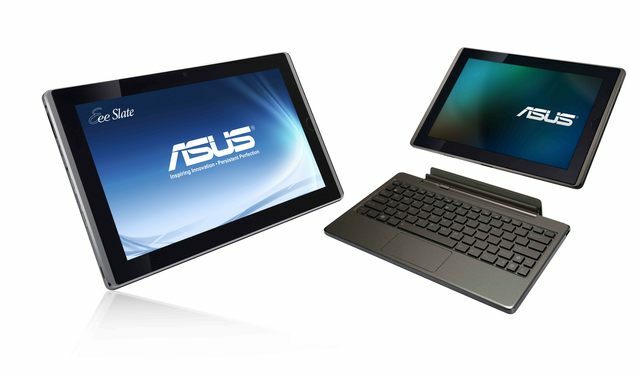 First impressions from our hands-on on the way..
That’s great, it just the same size of my netbook. I love it because it’s detachable. You just bring the screen wherever you go and leave the keyboard at home.